The other day I was taking a break from my work day by relaxing on the patio, and I was thinking it would be a nice time for a margarita!! Margaritas are like the perfect drink. They’re tangy, salty, and sweet with a citrus kick! And I wondered how it would taste poured over grilled meat or fish. For obvious reasons, pouring a margarita over an open flame is probably not the best idea, but I wanted to incorporate it somehow. With wild lobster tails in the freezer, I set out to experiment. I mixed the ingredients of a margarita and poured it into a stick of softened butter, BOOM!! It worked. Basting sweet lobster tails with the margarita butter before and during grilling, gave just enough flavor to these tails and made a quick MEAT ON A STICK MONDAY treat. You can serve it as is, or for a main course option, serve it with a creamy lime peel orzo and grilled asparagus, which also got a basting of margarita butter. Not wanting to waste anything, I used leftover lime juice to make a tangy vinaigrette to mix with peppery little radish sprouts and sliced crunchy radishes. The combo just works! If you don’t want to make the vinaigrette, use the leftover lime juice for what else??? A margarita of course!! Enjoy Summer, everyone. Mix the tequila, lime juice, lime peel, jalapeño, onion powder, cayenne pepper, sugar, salt and pepper and a stick of softened butter in a small bowl. Remove the lobster tails from their shells, by using a soup spoon to gently slide between the shell and lobster meat. 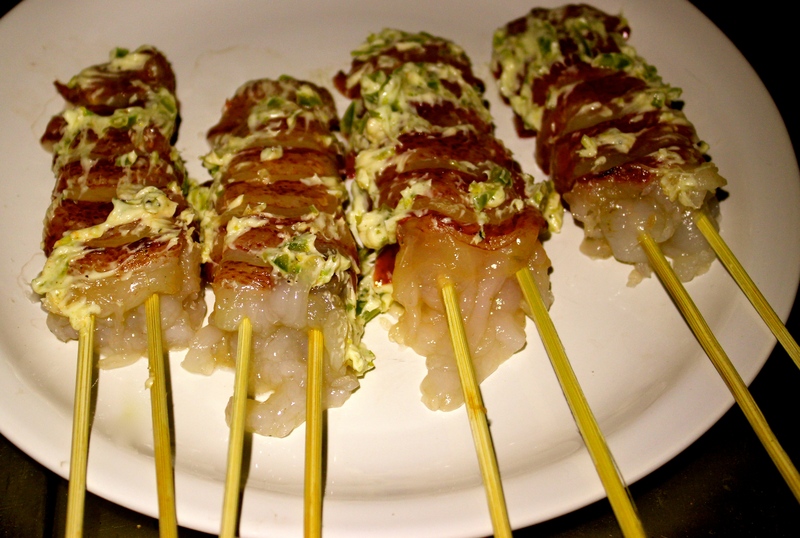 Then use two skewers to keep the tails from curling and make turning them easier. Baste the raw tails with butter on both sides, and place on the grill. After a 2 minutes, turn the tails over and baste again. Grill for 2 more minutes, then turn off heat and baste once more on both sides. Then remove and serve!! Enjoy! It's like a margarita basted lobster tail!! 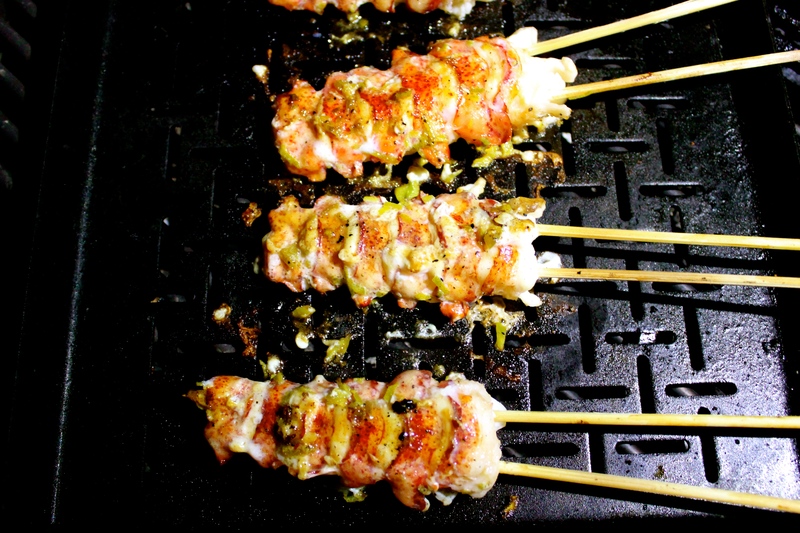 Make a margarita flavored butter to baste sweet skewered grilled lobster tails for this Meat On A Stick Monday during grilling season!! Enjoy Summer Everyone! **1/4 cup Reserved Lime Juice from the lobster recipe. Mince the jalapeño, and add to a bowl. Zest the limes and mince into small pieces, add to the bowl. Squeeze the juice from one lime for 3 tablespoons juice, and add to the bowl. 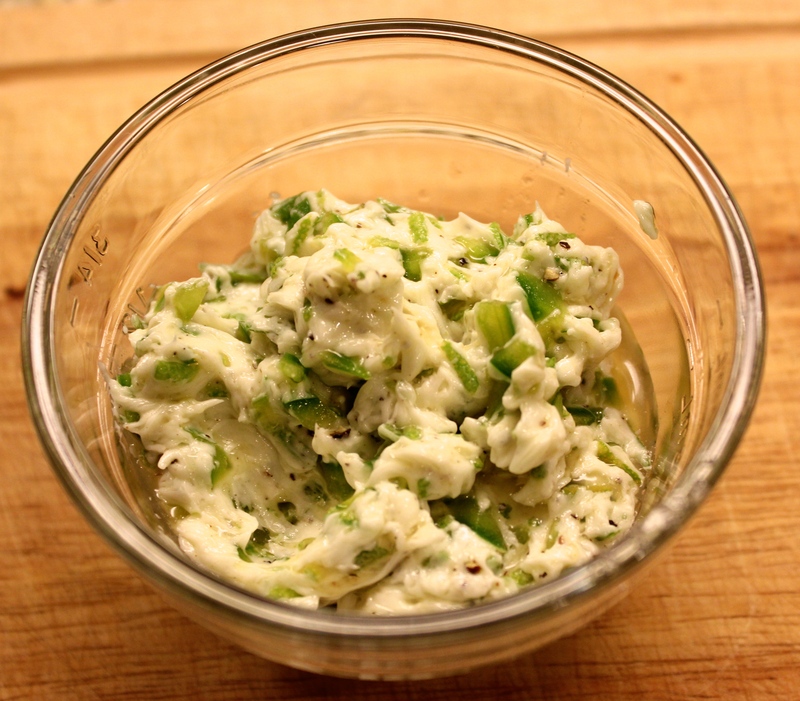 Soften butter and add remaining ingredients and mix. Remove the lobster meat from the shell by using a soup spoon to gently slide it between the shell and the meat, until the lobster meat releases from the shell, go gently so as not to tear the meat. 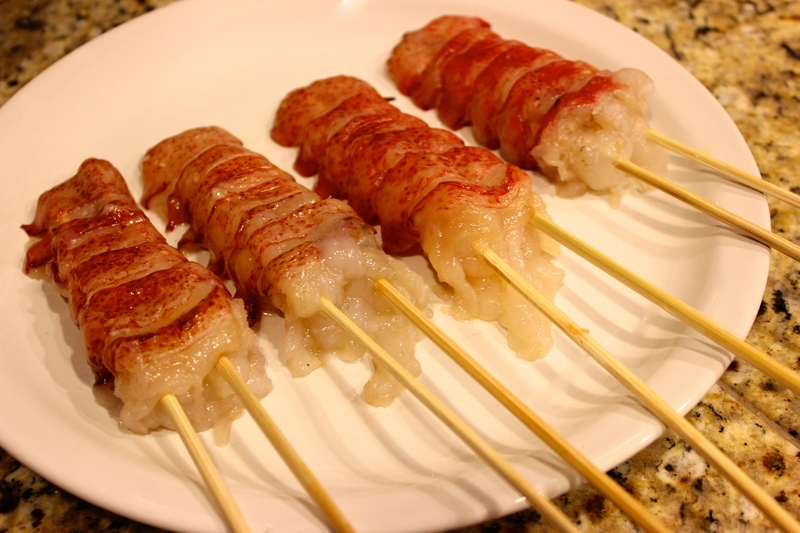 Once all the lobster tails are free of their shells, skewer the tails using two skewers per tail. Heat the grill to 300ºF (don’t get the grill too hot, people often make this mistake when cooking lobster and it will create a rubbery result, lobster needs lower heat). Using a pastry brush, baste both sides of the lobster tails, and place on the grill. 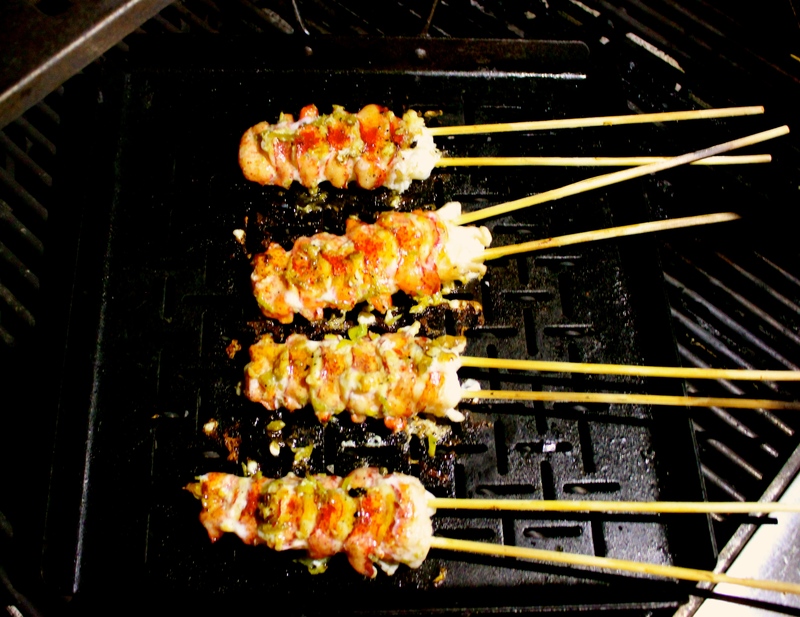 Sear the lobster skewers for 2 minutes, then flip over and baste again. Sear for another 2 minutes. Turn off grill and baste once more all over and leave for 30 seconds. 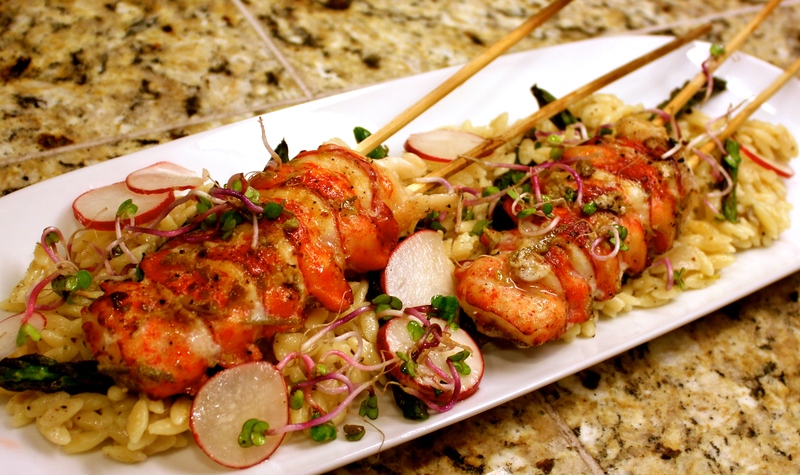 *As a rule of thumb, grill lobster tails 30-45 seconds per ounce. ** Use any extra margarita butter to baste asparagus while grilling. ***Reserve all the extra lime juice for a vinaigrette (if desired)…or a MARGARITA!! Mince the shallot and set aside. Zest the lime and mince very small and set aside. Juice the lime and reserve for later. Heat the butter and oil in a medium sized pot over medium heat. Add the shallot and sauté 1 minute. Add the dry orzo, and stir to coat with oil and butter, for about 90 seconds. Bring just to a boil, then turn down to low simmer, continue stirring periodically for about 8-9 minutes..
*The trick is to try to have the orzo cook and have most of the chicken stock absorb into the orzo by the time it’s cooked. Once the orzo is just “al dente” and most of the stock is absorbed, remove from heat, and add the mascarpone cheese, lime zest, lime juice, parmesan, and season with pepper, then taste and add salt. Add the *reserved lime juice from the lobster recipe, minced shallot, dijon mustard, sugar to a measuring cup and whisk to combine. While whisking, pour in just enough oil to create an emulsion. Rinse radishes and slice very thin. Add radish sprouts to a bowl, and pour over some vinaigrette, and toss. Add radish slices, and serve immediately.